Throughout the Middle Ages, witnessing was a crucial way religious and legal “truths” were understood and produced. Religious and secular officials alike harnessed the power of testimony to assert doctrinal, political, or legal responsibilities. Swearing an oath, testifying in court, and signing a deposition were common ways to shape and discipline both devotional and legal communities. 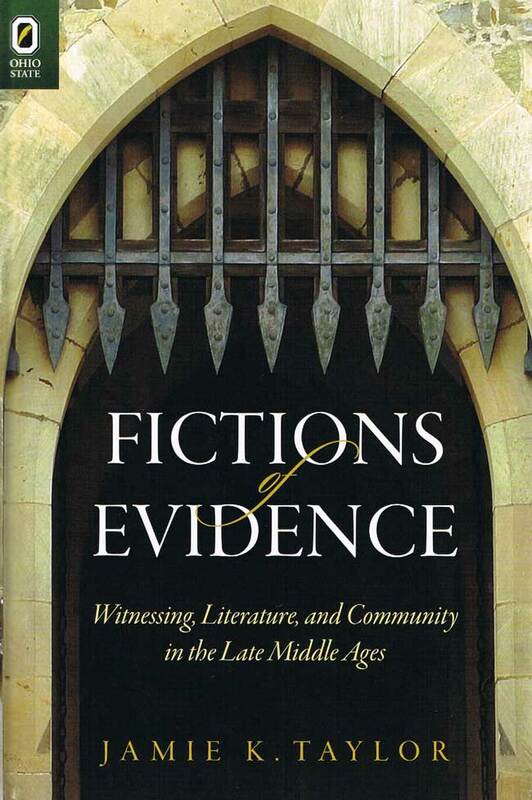 In Fictions of Evidence: Witnessing, Literature, and Community in the Late Middle Ages, Jamie K. Taylor traces depictions of witnessing in a wide range of late medieval texts and shows how witnessing practices formed and reformed, policed and challenged medieval communities. Through close study of texts like the Man of Law’s Tale and Piers Plowman alongside sermon exempla, common law statutes, and pastoral treatises, Fictions of Evidence argues that devotional and legal witnessing practices offered medieval writers a distinct vocabulary they could use to expose how the ethical and legal obligations to one’s community were constructed. And since vernacular writers often challenged the ways ecclesiastical or secular authorities asserted community bonds, they found they could use those same witnessing practices and language to imagine extra-legal or extra-ecclesiastical communities that followed different ethical codes. Jamie K. Taylor is assistant professor of English at Bryn Mawr College.